My little crochet blog is growing up! Just like with children, my blog has gone through changes over the years. And just like raising children, I have also experienced many changes and learned a whole lot over the short lifetime of my blog. Today, I am celebrating my blog turning THREE and I want to include you! Keep reading for updates on where Left in Knots has been, where it is going, and then enter for your chance to win some printable crochet pattern PDFs! How did this crochet blog get started? If you’re just here to enter to win patterns - go ahead a scroll down to the bottom of this post. I won’t be offended ;) But if you like stories and want to hear a little bit about where my blog is headed then go ahead and read on. Three and a half years ago, I was desperately trying to think of a way to quit my job so that I could stay home with my then 7 month old little girl. Have you ever gotten to a point in your life where you knew you needed to change something, and you end up deciding to take a big leap before you have all the plans or answers? Yeah…that was me. Just over 3 years ago, I quit my job with the hope that somehow I could make enough money crocheting to stay home with my daughter. My blog started small and I definitely had some massive struggles getting it started. But now over the past few years it has grown into something that, while not huge, is enough to allow me to stay home with my babies. My focus on Left in Knots has always been to publish free crochet patterns. I tend to focus on relatively simple projects that use one skein of yarn and are easy to start and stop. That being said, I don’t limit my pattern writing either and I enjoy working bigger and more complex projects into the mix sometimes. I like to think of myself as a bit of a scatter brained crafter - and I’m totally cool with that! Creativity should never be limited. To date, I have published over 150 free crochet patterns that you can find here. Where is this crochet blog headed? Last year was a challenging year for me to keep my blog going. Between having a newborn, selling our house and moving into a new house all within the span of 6 months - certain areas of my blog had to be set aside. More Free Crochet Patterns - simply put, last year I didn’t publish as often as I’d like. This year, I am planning more frequent free crochet patterns. Around 3-4 per month! Giveaways - I plan to continue monthly giveaways into the indefinite future. Just one of my ways to say THANK YOU for supporting me through your clicks, likes, and follows. Seven Days, Seven Skeins - for the past three years I have published the Seven Days of Scarfie around November/December. This year, I’m branching out a bit and will be using different yarns, too! 7 days, 7 free one-skein patterns - you won’t want to miss it! I will announce the details later in the summer. More video tutorials - having small children, I still have a challenge finding time to crochet full video tutorials. Now that I have an office it is something I am going to be working on more often now though. They will always be available both right and left handed. Updated patterns - if you look at my main blog page, you may notice one of my previous patterns popping up as “new” every once in a while. I am going through some of my more popular patterns and updating photos, instructions, videos, etc. as needed. If one pops up to the top - it means it’s been updated! See my latest updated pattern here. Basically, I’m just going to try to keep writing quality crochet patterns that you guys love! Is there anything you are just dying to see on the blog? A certain type of pattern, technique, genre, craft, tutorial, etc? Let me know here! In addition to the pattern giveaway (we’re almost there, I promise) I also put together several different pattern bundles in my Etsy shop AND they are on sale for this week only for an awesome price! All of my patterns are free on my blog, but if you prefer ad-free printable PDFs this is a great way to add some to your collection at a terrific price. 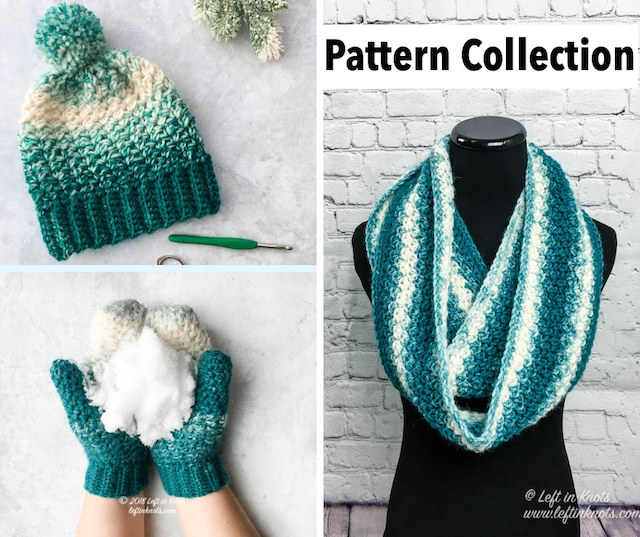 My Seven Days of Scarfie Pattern Collections are also included in this sale price! As another way to say “thanks” for coming along on my little crochet adventure with me, I am also giving away 10 individual patterns to 3 lucky winners! Each winner will get to choose their favorites from my Etsy store. This giveaway is open to anyone who has an email address that I can send pattern PDF files to - so enter if you love free stuff! When you enter you are entering to win 10 individual patterns of your choice from my Etsy shop! The winners will be contacted via the email addresses entered in the form above. This contest is open to anyone with an email address that can receive PDF attachments and runs from 3/25/19 to 4/1/19 at 12AM CST. At this time three winners will be selected. Good luck everyone and thank you for entering! This post contains affiliate links. I will earn a small portion of purchases you make through these links at no extra cost to you!